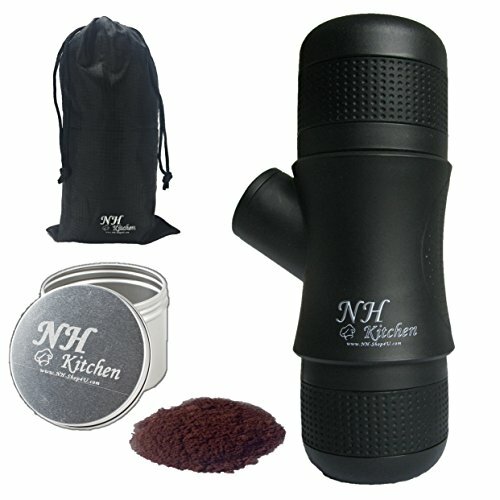 Get NH-KITCHEN PORTABLE ESPRESSO MAKER! WHAT MAKES OUR COFFEE MACHINE SPECIAL? Click the ADD TO CART BUTTON to get NH-KITCHEN PORTABLE ESPRESSO MAKER. ENJOY ESPRESSO ANYWHERE: With the NH-KITCHEN MINI ESPRESSO MAKER you can pump out an espresso using no electricity, chargers, or batteries; the complete product only needs ground coffee and hot water to produce ready-to-drink espresso in a relatively short time manually; the all-black unit comes with a bonus container for ground coffee plus an elegant carrying bag in a gift box ready for giving. EASY TO USE: The portable design of the NH-KITCHEN MANUAL ESPRESSO MACHINE is simple and fast to use in 3 steps; by using the incorporated measuring scooper, add ground coffee in the non-paper filter; next add hot water to the chamber; lastly, push the pressure pump by hand to operate the machine, preparing in the included cup an amazing Espresso anywhere. Add milk to the espresso and you will have your perfect cappuccino. NO ELECTRICITY OR BATTERY NEEDED: Because the NH-KITCHEN PORTABLE ESPRESSO UNIT is manual and environmentally friendly, there is no need for batteries, USB charging, or electrical outlets; make a cup of fresh espresso when traveling, camping, hiking, fishing, at the office, or on an airplane; being compact, the product can be put in a backpack, tote, or luggage, etc. BONUS GIFTS INCLUDED: Every high-quality NH-KITCHEN MANUAL COFFEE MAKER comes with a container to store enough fresh coffee grounds to make 7 cups of coffee plus an elegant protective carry bag for the machine; this makes a great gift for the coffee lover who is on the go and wants an espresso anywhere and at anytime. SATISFACTION GUARANTEE: We strive to provide you with the highest quality product and the best customer experience possible; if you're not entirely satisfied, please contact us immediately. Order with confidence your NH-KITCHEN MINI ESPRESSO MAKER with built-in scooper,no-paper filter, and cup that comes with a FREE coffee container and carry bag; enjoy espresso instantly. If you have any questions about this product by NH-Kitchen, contact us by completing and submitting the form below. If you are looking for a specif part number, please include it with your message.